I’m frequently asked how I get everything done and the answer is that I don’t! There are so many things that drop off my to-do list due to lack of hours in the day, or if I’m honest lack of desire. Some things I’m getting better at getting help with; I now have a cleaner every few weeks so we don’t get swallowed up in mountains of dog hair and the wonderful Nadia has started helping me out with some social media promotions and general organisation. Every day is short and I want to make sure I get what’s most important and what I enjoy done every day. I love answering knitters’ questions, whether it’s on my boards, in a KAL or in my Craftsy classes. This means that a good chunk of my time is spent just chatting online. This does mean that it can be a bit more difficult to find time for bigger jobs like writing blog post, patterns and newsletters. I won’t even mention my inability to do longer-term planning! One thing that almost never drops off my daily to-do list is knitting. That might seem obvious but running a knitting business actually makes it very difficult to find knitting time. While knitting is still obviously a big part of my job it easily gets side-lined for computer-based work. However, if I’ve reached the evening without having picked up my needles I start to get a bit twitchy. After all these years I still find knitting relaxing and comforting. When I grab my knitting and sit on my sofa spot (we’ve all got our special spot…mine has a stack of cushions, a standing lamp, table and of course Lizzie) its instant relaxation. When the boys were younger I knit more on the go, I had bigger stretches of time in the car waiting for people. Now with 3 different schools, I only get a few minutes knitting time between each collection. So how does my design and knitting day look? My youngest is already 10 and we’re on our last 2 years of primary school. This ends earlier so it keeps my workday short. In the morning after drop-offs and dog walking, I have computer time. This is what allows me to relax with my knitting later on. I plan as much as I can on paper; first, from the swatch, I measure my gauge and put it into my spreadsheet. From there I calculate the stitches and rows I need for each section of the pattern that I’m working on for every size. Next, I write a bare-bones pattern to work from including all the charts I’ll need. This means that as I’m knitting I can effectively test the pattern out as I go, rewriting as I work so that the knitting flows more smoothly. Step 15: For book or collection repeat from step 1! There are probably more steps then you had imagined but they’re all needed to get a pattern professionally ready. Obviously, this becomes much more complex if you’re working on a book as there is also a lot of non-pattern writing, illustrations and photos. 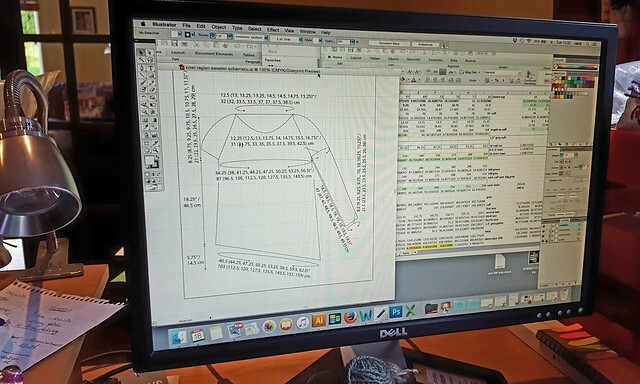 In terms of software I use, for drawing schematics I use Adobe Illustrator. It took a little while to figure it out but now I’m able to use enough of the basics to do what I need to do. I know it’s got a lot more functionality that I use but it does the job I need. For charts, I usually use Stitch Mastery. If the charts use standard symbols then this program works really well. If I’m doing something a bit more complex I’ll do the chart in Illustrator. My son put a set of symbols together for me so I’m not drawing everything from scratch. It takes a bit longer but the charts it produces are beautifully crisp and sharp. **I’ve been talking about my knitting and designing for quite a while but if you want to do some relaxing pre-holiday knitting of your own come join our Wrap Up Winter KAL. Have fun knitting and finish some wonderful winter accessories for friends and family! Until the 1st of November, I’m offering 20% off all the patterns in this bundle with the code WRAPUP2016. Come get some KAL encouragement on the board here and when you’re finished post your FO here to be in with a chance of winning a prize on the 31st of December. ** Please note that this KAL is now over though you can stay up to date on any KAL information via our newsletter or over on Ravelry here. Which accessory is your favourite? Come tell me in the comments! Carol, you are and have been for the longest time, my knit designer idol. Yourself and your patterns, books and classes are truly what keeps me trying to move forward as a designer. Thank you so much for sharing! I often feel like I’m drowning between housework, caring for my boys (I only have 2, but they’re both Autistic), life – as well as balancing computer work, podcasting and actual knitting. There never seems to be anytime and inevitably something falls behind. I very much appreciate you sharing some of your process. Carol, this post is fantastic, and you didn’t even mention fitting in the travelling for classes etc. I’m still reeling from all the daily driving you told me about. I just can’t imagine how you fit in all of the above work with all your daily driving. But what impresses me most (besides your wonderful designs) is the amount of help you give on the threads, KALS, tutorials and your classes. I do not believe there is another designer who gives as much as you do. And yes, it is time you had some help be it in the form of Nadia, test knitters etc. I hope it eases your schedule and gives you some more time to yourself, to do whatever you choose. I’m glad it was of some help. It’s easy to drown in busyour life especially if you’ve got children with special needs. The extra physical and emotional energy that takes us enormous. I just love your designs…the detail is wonderful. Being new to knitting late in life-I just hope I can become more able to kit some of the things I’d reallly love to do. I’m currently knitting your Eilonwy Jr for my granddaughter…thanks for your Craftsy tutorial on short rows…so helpful. When I’m stuck I look on Youtube …hope to finish before Summer down here in the Antipodes. Thanks for sharing this, Carol; I must admit I did wonder how knitting designers got any time to actually KNIT, with all the other requirements of the job! Love your work!